This past weekend being the super bowl, Kyle and I were looking for something easy to make that would be ready in time for the big game. Sundays are usually low key for us, but since his boys get dropped off to their mom on Sunday afternoon, sometimes figuring out something to make for dinner can be a bit tricky. 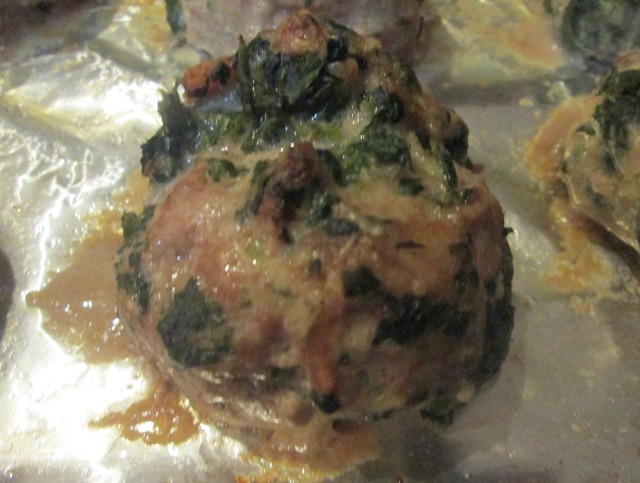 I’m all for an easy meatball recipe and after seeing a recipe for Sausage and Turkey Meatballs from Wife, Mom, Geek- I decided that this was something I needed to make. And did I mention that we also put bacon in ours? We always put chopped bacon in our meatloaf recipes, so since this was similar to that in terms of ingredients, I figured why not- let’s put some bacon in this too. Originally, I was going to try and wrap the meatballs in bacon. Maybe we’ll try that next time. 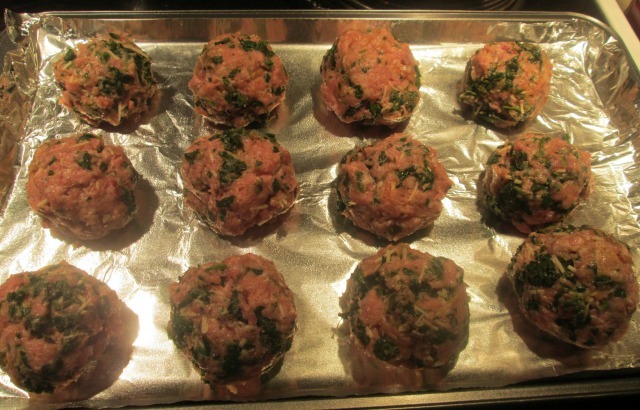 I’m not sure if I’m just incapable of making mini meatballs or if I was just thinking oh- this is similar to making meatloaf muffins, but I ended up with meatballs almost the size of a tennis ball. I think though, if we were making these for a party, I may have made them a bit smaller. I think the spinach could be optional, but I love spinach and I’m always looking for ways to incorporate it into a recipe. 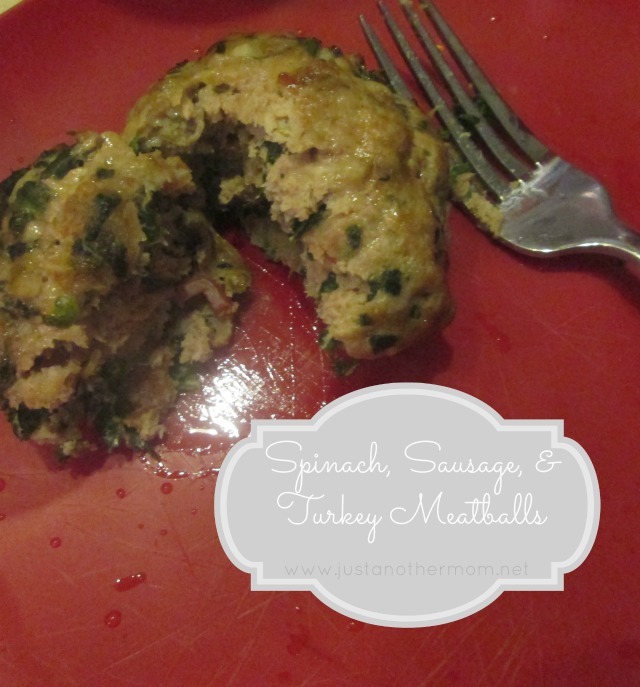 This was the first time I’d made meatballs but I think the next time we make meatloaf, we’ll add in spinach as well. What a great way to sneak in some veggies. Though you can’t really tell the actual size, maybe they were a little bit smaller than tennis balls. And who knows, if we make these for a party or something like that I’ll try to make them on the smaller size so they’re more bite sized. Very difficult to let these cool. I wanted to dive right in but I also knew that it would burn my mouth and my fingers. And since I kind of wanted to be able to taste this delicious creation, I let my patience kick in. 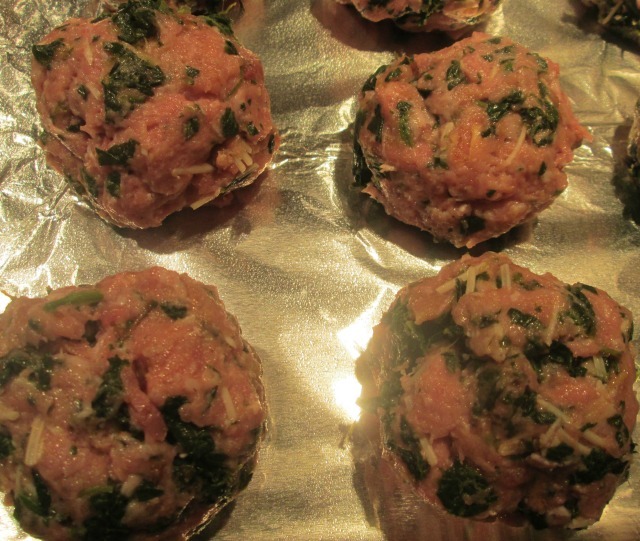 These also tasted delicious as a meatball sandwich, with or without sauce. Walmart had a lot of the really good turkey ground meat marked down, and I got some, but did not know what I was going to make with it. I see that this is a very good recipe to make with it! Thanks for a delicious recipe! Thanks for sharing such a tasty recipe! I love that these meatballs are baked, not fried! These look really good, thank you for sharing! This is a recipe I would love to try. They look really good. The recipe sounds pretty good. I can’t stand turkey so I would use maybe ground chicken instead.